Ludwig Holberg, Baron Holberg, the great Scandinavian writer, was born at Bergen, in Norway, on the 3rd of December 1684. Both Holberg's parents died in his childhood, his father first, leaving a considerable property; and in his eleventh year he lost his mother also. Before the latter event, however, the family had been seriously impoverished by a great fire, which destroyed several valuable buildings, but notwithstanding this, the mother left to each of her six children some little fortune. In 1695 the boy Holberg was taken into the house of his uncle, Peder Lem, who sent him to the Latin school, and prepared him for the profession of a soldier; but soon after this he was adopted by his cousin Otto Munthe, and went to him up in the mountains. His great desire for instruction, however, at last induced his family to send him back to Bergen, to his uncle, and there he remained, eagerly studying, until the destruction of that city by fire in 1702, when he was sent to the University of Copenhagen. But he soon exhausted his resources, and, having nothing to live upon, was glad to hurry back to Norway, where he accepted the position of tutor in the house of a rural dean at Voss. He soon returned to Copenhagen, where in 1704 he took his degree, and worked hard at French, English and Italian. But he had to gain his living, and accordingly he accepted the post of tutor once more, this time in the house of Dr. Smith, vice-bishop of Bergen. The good doctor had travelled much, and the reading of his itineraries and notebooks awakened such a longing for travel in the young Holberg that at last, at the close of 1704, having scraped together 60 dollars, he went on board a ship bound for Holland. He proceeded as far as Aix-la-Chapelle, where he fell sick of a fever, and suffered so much from weakness and poverty, that he made his way on foot to Amsterdam, and came back to Norway. Ashamed to be seen so soon in Bergen, he stopped at Christianssand, where he lived through the winter, supporting himself by giving lessons in French. In the spring of 1706 he travelled, in company with a student named Brix, through London to Oxford, where he studied for two years, gaining his livelihood by giving lessons on the violin and the flute. He mentions, with gratitude, the valuable libraries of Oxford, and it is pleasant to record that it was while he was there that it first occurred to him, as he says, "how splendid and glorious a thing it would be to take a place among the authors." Through London and Elsinore he reached Copenhagen a third time, and began to lecture at the university; his lectures were attended, but he received no money. He was asked in 1709 to conduct a rich young gentleman to Dresden, and on his return journey he lectured at Leipzig, Halle and Hamburg. Once more in Copenhagen, he undertook to teach the children of Admiral Gedde. Weary with this work, he took a post at Borch College in 1710, where he wrote, and printed in 1711, his first work, An Introduction to the History of the Nations of Europe, and was permitted to present to King Frederick IV two manuscript essays on Christian IV and Frederick III. The king soon after presented him with the title of Professor, and with the Rosenkrantz grant of 100 dollars for four years, the holder of which was expected to travel. Holberg accordingly started in 1714, and visited, chiefly on foot, a great portion of Europe. From Amsterdam he walked through Rotterdam to Antwerp, took a boat to Brussels, and on foot again reached Paris. Walking and skating, he proceeded in the depth of winter to Marseilles, and on by sea to Genoa. On the last-mentioned voyage he caught a fever, and nearly died in that city. On his recovery he pushed on to Civita Vecchia and Rome. When the spring had come, being still very poor and in feeble health, he started homewards on foot by Florence, across the Apennines, through Bologna, Parma, Piacenza, Turin, over the Alps, through Savoy and Dauphin to Lyons, and finally to Paris, where he arrived in excellent health. After spending a month in Paris, he walked on to Amsterdam, took sail to Hamburg, and so went back to Denmark in 1716. He spent the next two years in extreme poverty, and published his Introduction to Natural and Popular Law. But at last, in 1718, his talents were recognized by his appointment as professor of metaphysics at the University of Copenhagen; and in 1720 he was promoted to the lucrative chair of public eloquence which gave him a seat in the consistory. His pecuniary troubles were now at an end. Hitherto he had written only on law, history and philology, although in a Latin controversy with the jurist Andreas Hojer of Flensborg his satirical genius had flashed out. But now, and until 1728, he created an entirely new class of humorous literature under the pseudonym of Hans Mikkelsen. The serio-comic epic of Peder Paars, the earliest of the great classics of the Danish language, appeared in 1719. This poem was a brilliant satire on contemporary manners, and enjoyed an extraordinary success. But the author had offended in it several powerful persons who threatened his life, and if Count Danneskjold had not personally interested the king in him, Holberg's career might have had an untimely close. During the next two years he published five shorter satires, all of which were well received by the public. The great event of 1721 was the erection of the first Danish theater in Grönnegade, Copenhagen; Holberg took the direction of this house, in which was played, in September 1722, a Danish translation of L'Avare. Until this time no plays had been acted in Denmark except in French and German, but Holberg now determined to use his talent in the construction of Danish comedy. The first of his original pieces performed was Den politiske Kandestöber (The Pewterer turned Politician); he wrote other comedies with miraculous rapidity, and before 1722 was closed, there had been performed in succession, and with immense success, Den Vaegelsindede (The Waverer), Jean de France, Jeppe paa Bjerget, and Gert the Westphalian. Of these five plays, four at least are masterpieces; and they were almost immediately followed by others. Holberg took no rest, and before the end of 1723 the comedies of Barselstuen (The Lying-in Room), The Eleventh of July, Jakob von Thyboe, Den Bundeslöse (The Fidget), Erasmus Montanus, Don Ranudo, Ulysses of Ithaca, Without Head or Tail, Witchcraft and Melampe had all been written, and some of them acted. In 1724 the most famous comedy that Holberg produced was Henrik and Pernille. But in spite of this unprecedented blaze of dramatic genius the theater fell into pecuniary difficulties, and had to be closed, Holberg composing for the last night's performance, in February 1727, a Funeral of Danish Comedy. All this excessive labor for the stage had undermined the great poet's health, and in 1725 he had determined to take the baths at Aix-la-Chapelle; but instead of going there he wandered through Belgium to Paris, and spent the winter there. In the spring he returned to Copenhagen with recovered health and spirits, and worked quietly at his protean literary labors until the great fire of 1728. In the period of national poverty and depression that followed this event, a puritanical spirit came into vogue which was little in sympathy with Holberg's dramatic or satiric genius. He therefore closed his career as a dramatic poet by publishing in 1731 his acted comedies, with the addition of five which he had no opportunity of putting on the stage. With characteristic versatility, he adopted the serious tone of the new age, and busied himself for the next twenty years with historical, philosophical and statistical writings. 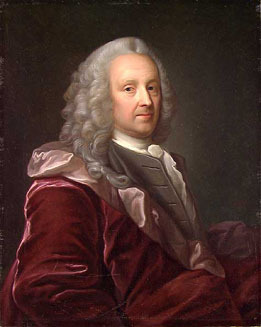 During this period he published his poetical satire called Metamorphosis (1726), his Epistolae ad virum perillustrem (1727), his Description of Denmark and Norway (1729), History of Denmark, Universal Church History, Biographies of Famous Men, Moral Reflections, Description of Bergen (1737), A History of the Jews, and other learned and laborious compilations. The only poem he published at this time was the famous Nicolai Klimii iter subterraneum (1741), afterwards translated into Danish by Baggesen. When Christian VI died in 1747, pietism lost its sway; the theater was reopened and Holberg was appointed director, but he soon resigned this arduous post. The six comedies he wrote in his old age did not add to his reputation. His last published work was his Epistles, in 5 volumes, the last of them posthumous (1754). In 1747 he was created by the new king Baron of Holberg. In August 1753 he took to his bed, and he died at Copenhagen on the 28th of January 1754, in the seventieth year of his age. He was buried at Sorö, in Zealand. He had never married, and he bequeathed all his property, which was considerable, to Sorö College. Holberg was not only the founder of Danish literature and the greatest of Danish authors, but he was, with the exception of Voltaire, the first writer in Europe during his own generation. Neither Alexander Pope nor Jonathan Swift, who perhaps excelled him in particular branches of literary production, approached him in range of genius, or in encyclopaedic versatility. Holberg found Denmark provided with no books, and he wrote a library for her. When he arrived in the country, the Danish language was never heard in a gentleman's house. Polite Danes were wont to say that a man wrote Latin to his friends, talked French to the ladies, called his dogs in German, and only used Danish to swear at his servants. The single genius of Holberg revolutionized this system. He wrote poems of all kinds in a language hitherto employed only for ballads and hymns; he instituted a theater, and composed a rich collection of comedies for it; he filled the shelves of the citizens with works in their own tongue on history, law, politics, science, philology and philosophy, all written in a true and manly style, and representing the extreme attainment of European culture at the moment. Perhaps no author who ever lived has had so vast an influence over his countrymen, an influence that is still at work after centuries.